The fascia is mounted at the point where the roof meets the outer walls of your property and is often called the Roofline. However most people refer to it by the name of the main board that carries the gutter and the tiles – the fascia or fascias. Unfortunately, not many people are familiar with these technical names , so we thought you might appreciate a few words of explanation. This is the board that is used on the gable end of a property or apex as it is also refered to. The condition of the bargeboard can often lets a property due to not getting the maintenance required due to how high they are. The soffit board is tucked away underneath the fascia board. The soffit can be ventilated to allow the flow of air into the roof area. 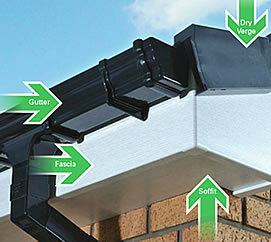 Alternatively ventilation can be provided over the top of the fascia board. Many people prefer the latter solution these days. Without adequate ventilation, condensation will form in the roof void increasing the risk of timber decay on your property . We do not cover up old rotting wood we completely remove new upvc fascia and soffit, dry verge(if requested), and new guttering allowing all the rain water to be collected.